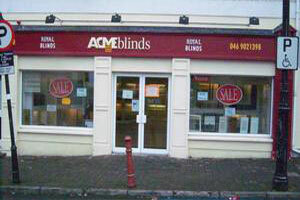 Acme Blinds Meath offer a free measuring and fitting service to all areas of Meath. Our Showroom in Navan has beautiful displays of all types of Blinds including roller blinds, blackout blinds and roman blinds. We have over 60 years experience fitting and supplying made-to-measure blinds in Navan and County Meath. If you would like to avail Free Home Advice, Quotation, Measuring & Fitting Service and if you live in the Meath or Navan area please contact our showroom.